CINCINNATI, OH (August 2, 2012) – “Sarah,” the Cincinnati Zoo’s 11-year-old cheetah, sets new world speed record! She first earned the title of world’s fastest of all land mammals in 2009 when she covered 100 meters in 6.13 seconds, breaking the previous mark of 6.19 seconds set by a male South African cheetah named Nyana in 2001. This year, Sarah shattered all 100-meter times when she posted 5.95 seconds. By comparison, Sarah”s 100-meter run was nearly four seconds faster than the world”s fastest man, Usain Bolt of Jamaica, whose fastest time for the same distance is 9.58 seconds. Sarah’s top speed was clocked at 61 mph. Sarah and the Cincinnati Zoo’s other four cheetahs in the Cat Ambassador Program were at the Zoo’s Regional Cheetah Breeding Facility as part of a project that will be featured in the November issue of National Geographic Magazine, which will include never-before-seen high speed photographs of cheetah movement. The documentation of the run was also supported by National Geographic’s Big Cats Initiative, a long-term effort to halt the decline of big cats in the wild through assessment efforts, on-the-ground conservation projects, education, economic incentive programs and a global public-awareness campaign. Information is available at CauseAnUproar.org. Cameras captured the record-breaking run on Sarah’s first attempt as she chased a fluffy dog toy lure on a specially designed course certified by the Road Running Technical Council of USA Track & Field. Cheetahs are built for speed. Their flexible spine allows their front legs to stretch far forward on each stride, covering 20 to 22 feet in one stride, about the same distance as a racehorse. 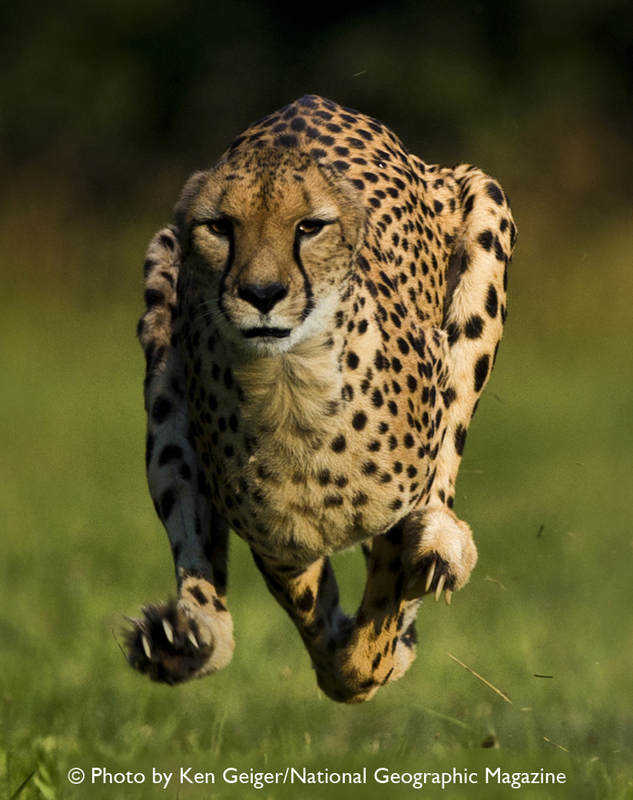 Cheetahs are off the ground more than half of their running time. Their claws are hard and sharp like cleats, giving them great traction when they run. Cheetahs are endangered, and their population worldwide has shrunk from about 100,000 in 1900 to an estimated 9,000 to 12,000 cheetahs today. The Cincinnati Zoo has been dubbed “The Cheetah Capital of the World” because of its conservation efforts through education, public interpretation, and the cheetah breeding program in zoos. The Zoo’s Regional Cheetah Breeding Center is one of only four similar facilities in the United States managed by the Species Survival Plan. In total, there have been 64 cheetah cubs born in Cincinnati (new cub born 6/22/12 ). Since 1980 the Cincinnati Zoo’s “Cat Ambassador Program” has taken African cheetahs to schools and programs around the U.S, Canada, and Central America to spread the word that cheetahs are running for their lives. In addition, each summer the Zoo takes 22 school teachers to the Cheetah Conservation Fund’s headquarters in Namibia for a two-week conservation field study. Since 1990 the Cincinnati Zoo’s “Angel Fund,” named after our first cheetah ambassador, “Angel,” has directly supported cheetah conservation in Africa. From South African and Namibia in the south, up through Kenya and Tanzania in East Africa, The Angel Fund has contributed more than $1 million in support for cheetahs in the wild.